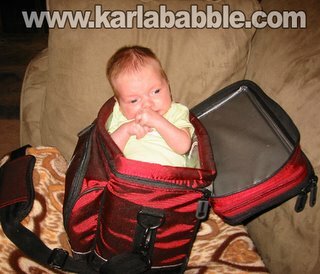 karlababble: My kid fits in things. I know he fits in the dryer. I know he fits in a camera bag. 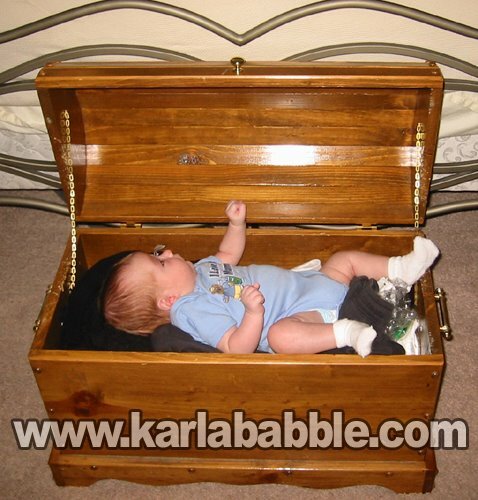 I know he fits in a wooden trunk. I know he fits in a drawer. I know these things because I have experimented, as you can see by my photographic proof. Now, taking these pictures was not easy. I had to sneak around my husband, who seemed to believe I was killing our son by putting him in these harmless locations. The dryer shot was particularly distressing to him. I defy any would-be photographer to get a good photo of anything with someone standing behind them whining, "Stop! What are you doing? Are you insane! You'll hurt him!" Does Jake look hurt in that picture? He's even wearing his "I Love Mommy" outfit, not his "I'm afraid of Mommy because she puts me in strange places and photographs me" outfit. When I finally managed to get that picture taken, the next logical step seemed to be photographing him inside the washer, but Brian snatched him and whisked him away before I could even finish suggesting the idea. Sadly, I'm afraid it's the end of an era. Jake is getting bigger, and there just aren't many cool places left in our house to cram him into. I suggested the fireplace, but Brian's head began to spin. So these four photos are all I'll have to remember that lovely time when my son was small enough to fit into things, and defenseless enough to allow it. Even though his shirt clearly said he loved you, his eyes told a different story. 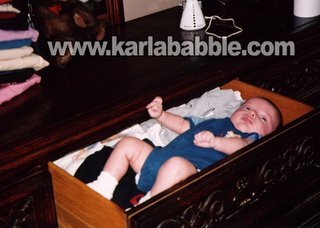 Namely, "who is this woman and why is she putting me in a drawer?" Ever think of putting your kid in the fridge? Or would that be a little too much for your husband? *Watch out for the inevitable hate mail. I know you won't let 'em get to ya tho'! Aaww how cute. Your son is adorable. Talented too, my kids only ever seem to fit in strollers and carseats, oh, and laundry baskets. The end of one era--but soon he'll be mobile and curious enough to figure out all the places he can squeeze into when you glance away for two seconds. *sigh* She used to put me in small places until Jake came along...oooh those were the days. Funny, Brian never seem to get upset about that. Finally someone with a sense of humor!!!! Who would send hate mail as a comment to this? 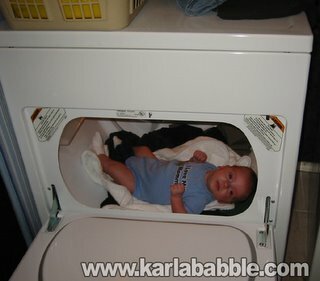 We have the next Anne Geddes on our hands B...screw the rose petals and pea pods...we've got Maytag and Canon! those are some good pictures karla. when he gets to be a teen you will want to stick him in the dryer again, even if he doesn't fit. trust me on this one. I'm so glad I didn't read this while I was at work, else I'd have called attention to my blogging madness with my peals of derisive laughter! I so want something tiny enough to stash places! I'm always trying to hide my sister's toy poodle in my purse, but he sneaks out or she catches me! I can't remember if this is real or if I imagined it, but I think there's a picture of my sister in a generic, brown box surrounded by styrofoam peanuts. Maybe I imagined it, or dreamed it up so I could tell her she came in the mail. I sometimes like to, uhm, exaggerate. But we did call her Peanut when she was tiny! I'm begging you, please don't give her any more photo ideas! Karla and I were big fans of Oolong, but I don't want the same life for our son. We have pics of our son everywhere! We put him in a popsicle box and in his stuffed animals with just his head sticking out! He didn't die, and he was cute as hell! I love your pics...gives me ideas about my little one! She may be visiting some small place tomorrow! You didn't think about this early enough, Tex. There was a time you could have gotten him into the Mixmaster bowl. Good times! What an easygoing baby you have. What about the microwave or is that location only reserved for teenage mothers tripping out on acid? Oh, and I applaud your laid-back style of mothering. How refreshing! A cr8ive Mum UR, well done. Haa! That's like a children's book in the making - well, aside from the fact that parents would be screaming that the kid was in all these "unsafe" places. That is the FUNNIEST THING I've seen done to a baby. Karla, you crack me up all the time and this is no different. That is some funny crap. And totally cute, too. I don't feel so bad about putting mine in the laundry basket or (empty) bathtub when I have to do a quick chore. she just cries if I put her in her crib, but the bathtub is way fun! Okay, I called to check. The Peanut in a box of styrofoam peanuts is a figment of my imagination. To ammend: I love my sister. Cut me some slack, I was five! I was very, uhm, creative when I was five! Put him more places! That's freaking hilarious! Those will be great to show his first girlfriend. Always gotta have imbarassing stories & pics for girlfriends. Dude, I'm totally doing this to my cats. That was either the funniest group of photos I have seen or the scariest. Ha Ha. That needs a "Don't try this at home disclaimer." awesome. normally i'm not a fan of baby pictures (sacriligious, i know) but those were awesome. i also loved the mental image of your husband standing behind you wondering if you're officially insane. hahaha. Late to the game here but I must say, if you keep thinking about it you'll come up with plenty more. If you check my archives you'll see my 6 year old was in the dryer not too long ago. He wouldn't come out either. He wanted his younger brother to shut it and turn it on so he could go for a ride. I however did NOT take a picture because the kids tend to see that as meaning I think it is funny. Do you know how hard it is not to laugh when coming upon these situations? 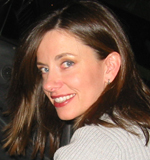 Just found your site and I love it. Don't stop now, you can put him lots of places where he'll fit nicely and he looks so happy in them. you CRACK me up!! Hilarious!! I think what's funniest about these photos is thinking about him seeing them in his teen years with the date he brought home. And I can't believe a member of the "Who'll think of the children?!" brigade hasn't found these and left nasty comments for you.